The Canadian Observatory on Homelessness which is a partnership organization of academics from universities across Canada, services providers, and governments recently released a new framework on preventing homelessness in our country. The number of people who are experience homelessness is increasing. This is evident in Metro Vancouver and in Langley City. The status quo cannot continue. 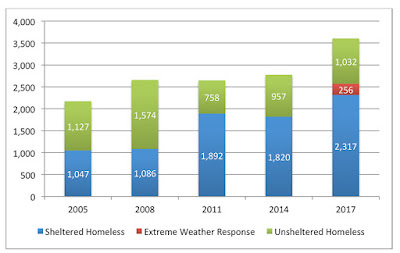 Proportion of the un-sheltered and sheltered people who are homeless in Metro Vancouver (2005, 2008, 2011, 2014 and 2017). Source: Metro Vancouver. The new framework is titled “A New Direction: A Framework for Homelessness Prevention”. The framework consists of five broad categories. Not surprisingly, ensuring that people have access to long-term, affordable housing is critical to preventing homelessness as two of the five categories are around housing matters. The following short video provides an overview of this framework. A New Direction: A Framework for Homelessness Prevention from The Homeless Hub on Vimeo. 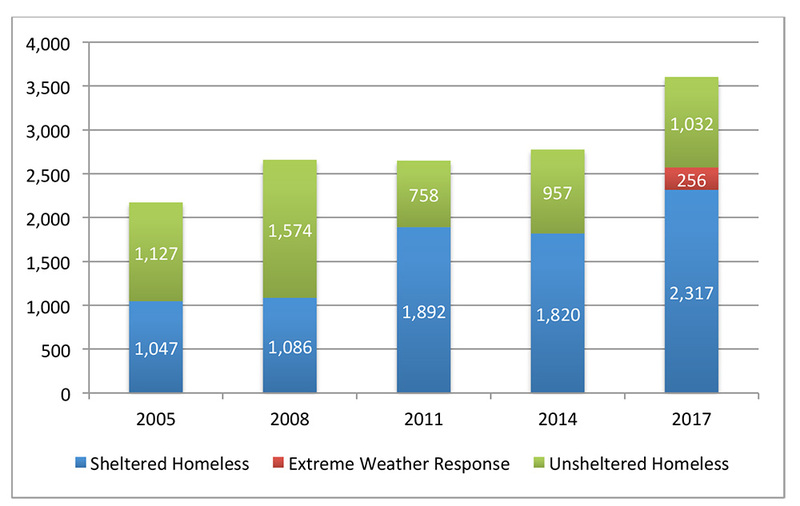 The number of people who are experiencing homelessness is increasing. Fresh approaches such as “A New Direction: A Framework for Homelessness Prevention” provides a framework for turning back the clock on the homelessness crisis in our communities. At last night’s Langley City council meeting, there were only a few items on the agenda. Some councillors were on their way to the annual Federation of Canadian Municipalities Conference in Ottawa, and were not at the meeting. At the end of April, grade 4 and 5 students from Langley City schools visited City Hall to learn about local government. The City has a “Getting to Know the City of Langley” guide which is distributed to students. Besides learning about local government, students also participated in a sponsored poster contest. Veronica Bryson from Nicomekl Elementary won the contest, and free lunch for her entire class as a result. Mayor Schaffer presented a certificate for winning the contest to Veronica at the council meeting. More information about Local Government Day and the contest can be found on the Langley City website. Mayor Schaffer presenting a certificate to Veronica Bryson. Select image to enlarge. Later during the meeting, council gave final reading to a zoning amendment bylaw for a small section of former lane near Park Avenue and 204 Street. Council also approved a request for Graham Flack who is the Deputy Director of Corporate Services to attend the Unit4 Connect Conference this year. Unit4 produces the software the City uses for financial and resource management. Langley City adopted a Homelessness Strategic Plan last year. One of the key recommendations from that plan was to create a Homeless Action Table (HAT) with representation from local governments, the provincial government, federal government, social service agencies, and faith-based organizations in our community. The Homelessness Action Table’s first meeting was held on May 17th. Work with the Intensive Case Management (ICM) team to formulate a partnership between the ICM team and the HIT. This partnership will allow the parties to identify client-specific barriers to success and collectively identify solutions to respond. Participating members may consider using BC Housing’s Vulnerability Assessment Tool (VAT) or other client assessment tools. As an extension of this strategy, HIT could collaborate with the RCMP and Bylaw officers to respond to police/Bylaw calls related to persons experiencing homelessness. HAT, through City Council, invite the Township to formally participate as a member of the HAT. Advocate to BC Housing and Fraser Health for a permanent supportive housing project. Advocate to BC Housing to increase the rent supplements and the numbers of rent supplements. Support the new Youth Resource Centre and continue to advocate for a Youth Safe House. Work with the Intensive Case Management (ICM) team to formulate a partnership between the ICM team and the HIT to facilitate better integration between health and housing services. This includes employing teams to address issues related to hoarding, bed bugs and other health and housing related issues and supporting these efforts by making information and training available to social service providers, housing providers, outreach teams and other teams (e.g. Homelessness Integration Team). THAT a letter be sent to the Township of Langley inviting a member of their Council to sit on Langley City’s Homelessness Action Table. Homelessness doesn’t respect municipal borders, and it will take all governments working together to reduce homelessness in our region. Our regional district, Metro Vancouver, provides many significant services. The big three services that Metro Vancouver provides are for water, sewer, and solid waste (garbage, recycling, and organics). When looking at your property tax bill, you’ll see a line item for Metro Vancouver, but that only represents a small amount of revenue that the regional district receives. Metro Vancouver charges municipalities for water and sewer services, and waste haulers for solid waste services, who then passed along the costs. In Langley City, between 60 to 70 percent of the charges on a typical tax bill for water and sewer services are passed to the regional district. Providing safe drinking water and waste water treatment requires major investment in infrastructure. For example, the recently completed Capilano-Seymour water project cost $820 million. The North Shore Wastewater Treatment Plant which is starting construction is budgeted to cost $700 million. These are just two of the many projects that the regional district is or has worked on. The Metro Vancouver board, which is mostly made up of elected officials from municipalities within the region, held a strategic workshop to help guide the development of a new 5-year financial plan. The follow drawings were produced at the strategic workshop. Metro Vancouver Board Strategic Planning Workshop - Scenario Directions. Select image to enlarge. 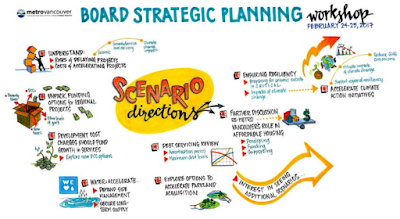 Metro Vancouver Board Strategic Planning Workshop - Details. Select image to enlarge. Are you can see, there was a discussion about two scenarios for funding Metro Vancouver services. “Steady as We Go” and “Slowing Things Down”. The “Steady as We Go” option seemed to be the direction that Metro Vancouver board members felt the regional district needs to go. This scenario will require around a 5% annual growth in revenue. “Slowing Things Down” defers projects to the future which would increase risk of providing reliable services, increasing costs in the future. Currently, developers pay for expanding local water and sewer services through Developer Cost Charges (DCCs) when new development projects are built. At the workshop, Metro Vancouver board members expressed interest in increasing DCCs to pay for regional projects that are required due to population growth. Metro Vancouver is also an affordable housing provider. 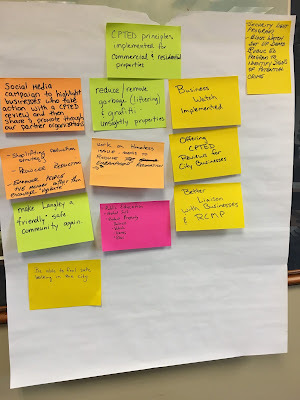 With the current affordable housing crisis in our region, workshop participants were interested in seeing the regional district’s role in providing affordable housing expand. Langley City is 10 square kilometres, and the community’s residential areas were essentially built-out before the turn of the 21st century. All new housing in Langley City has come from redevelopment over the past several decades. Our community has always had a mix of housing types, I found the following picture at City Hall earlier this week. As you can see, apartments were part of the mix even when Langley City still had farms. 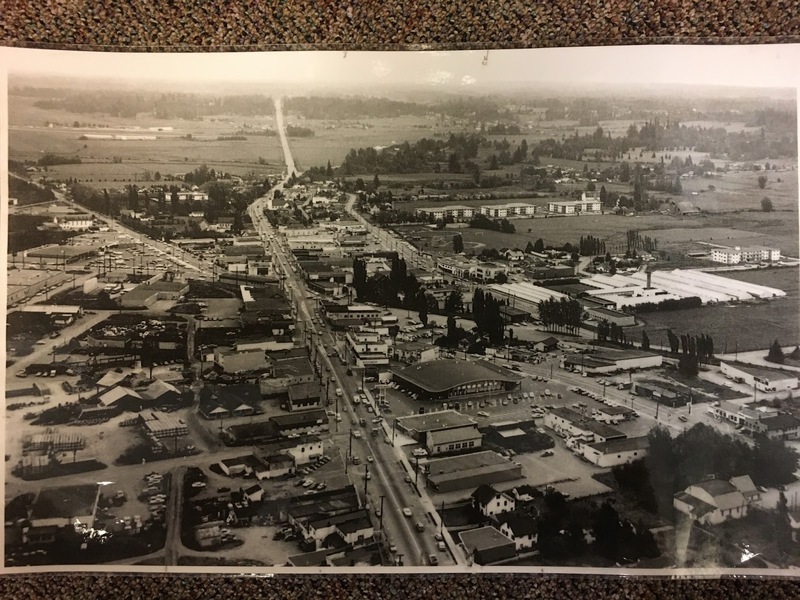 Photo of Langley City from the mid-twentieth century, looking east along Fraser Highway. Select image to enlarge. With the most recent census data now being released, I thought I’d look at what type of housing people are living in, both in terms of absolute numbers and as a percentage of total housing since 2001. I used data from the 2001, 2006, 2011, and 2016 census. The numbers are for private, occupied dwellings, they don’t include dwellings such as nursing homes, group homes, hotels, motels, and the like. 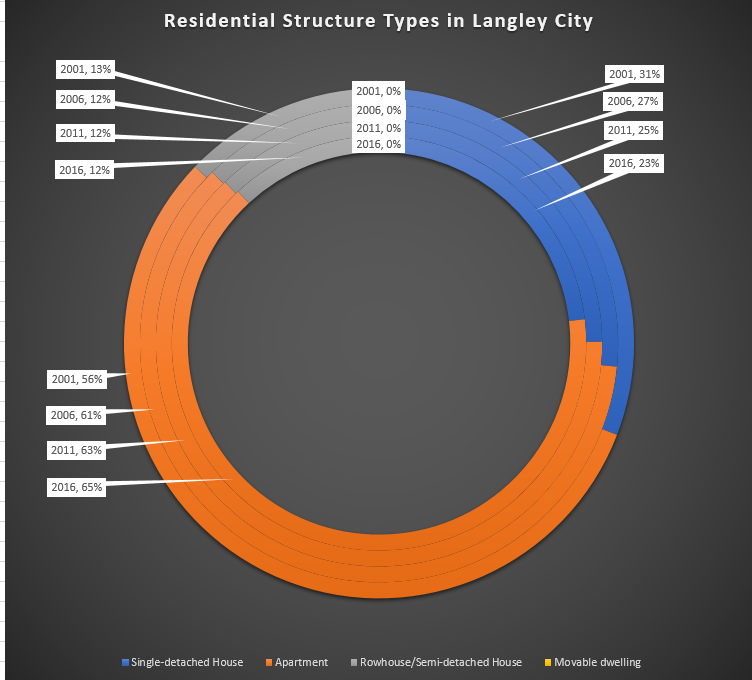 In absolute numbers, most housing types in Langley City have increased except for single-family housing and “movable dwellings.” In fact, the number of occupied single-family houses in our community has decreased in absolute terms. This makes sense as Langley City north of the Nicomekl has been zoned for higher density for some time. Areas south have been zoned for single-family housing, and no changes are in the works. Occupied private dwellings by structural type of dwelling between 2001 and 2016. Select chart to enlarge. Source: Statistics Canada. 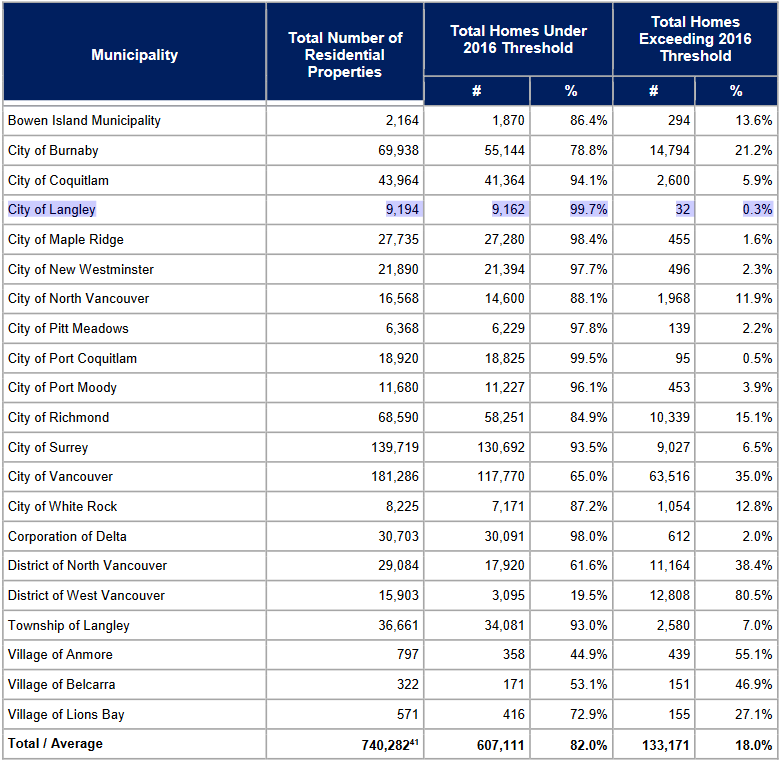 Today only 23% of households live in single-family housing in Langley City. The largest gains are for households that live in apartments. As a percentage of total housing, rowhousing has been relatively stable. Langley City has always been an urban centre, and the numbers show that our community’s status as a centre has only been reinforced. A note about the categories. Single-detached house includes: single-detached house and other single-attached house from the census. Rowhouse/semi-detached house includes: row house and semi-detached house from the census. Apartments includes: apartments, detached; apartments, five of more storeys; apartments, fewer than five storeys from the census. Langley City has recently moved away from standing citizen advisory committees to citizen advisory task groups. Committees are structured generally around a broad theme such as the environment or crime prevention while task groups have specific mandates around a focused topic. Unlike committees, task groups are disbanded once they have delivered on their mandate. An example of a task group was the Hunter Park Task Group. The task group’s mandate is to develop an ongoing strategy that will encourage the implementation of crime prevention through environment design as well as other programs that will help reduce and prevent crime. The task group includes five members from the community, and I was happy to see that there is someone younger than me serving on the task group. There are also members that represent the Downtown Langley merchants and Chamber of Commerce, as well as members from the RCMP. The task group heard a presentation from the RCMP. One of the interesting facts that the RCMP members pointing out is that crime against people is extremely low in Langley City, and that we are a safe community. According to the RCMP members, most crime committed in our community is property crime. A small number of people are responsible for most crime in our community. One of the major reasons why people steal is to feed their drug addiction. The RCMP members noted that to reduce these sorts of crime, the key is to get people the help they need to kick their addition. This could include helping people get into supportive housing, get into rehab programs, and find stable employment. The RCMP members gave the task group a brief overview of their community-based crime prevention programs. They also explained the importance of having people report all crime as it helps them figure our where to deploy their resources. 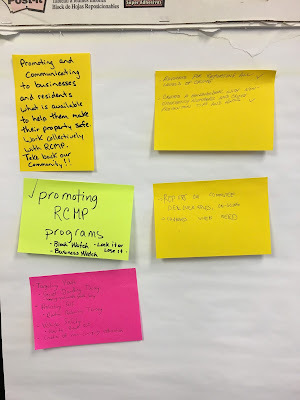 Before and after the RCMP presentation, I asked people to write down what actions they would like to see the task group work on to meet our mandate. What task group members would like to see the task group work towards before hearing the RCMP presentation. Select image to enlarge. Other items task group members wanted to work towards after hearing the RCMP presentation. Select image to enlarge. Based on discussion after the RCMP presentation, the committees’ work will likely fall into three broad categories: crime reporting awareness, crime prevention, and advocacy. It was a very productive meeting, and I look forward to working with task group members to fulfill our mandate. As a note, with summer now here, the RCMP will be stepping up their foot and bike patrols in Langley City. With the 203rd Street corridor now fully open to all modes of travel, and with its grand opening scheduled for June 9th, I’ve received some questions about this recently completed project. The project’s goals were to make the corridor safer and more inviting for people to walk or cycle. One of the other goals was to reduce speeding along the corridor. I put together the following video which provides a brief overview of the design goals of the project, and how they were implemented. I’m hoping this video will answer some of the questions I’ve received. I’m pretty excited about this project’s completion because it is the first corridor in our community that has been designed with all road users in mind, and has been designed to ensure that the majority of people driving do not exceed the speed limit. I see more people walking and riding their bicycles along 203rd than in the past, I’ve also seen a reduction in people speeding. Compared to the old design, it’s no surprise. Section of narrow sidewalk on 203rd Street at 54th Avenue from December 2014. Select image to enlarge. A recap of Metro Conversations #3: The Sacred Single Family Home. What are we trying to protect? 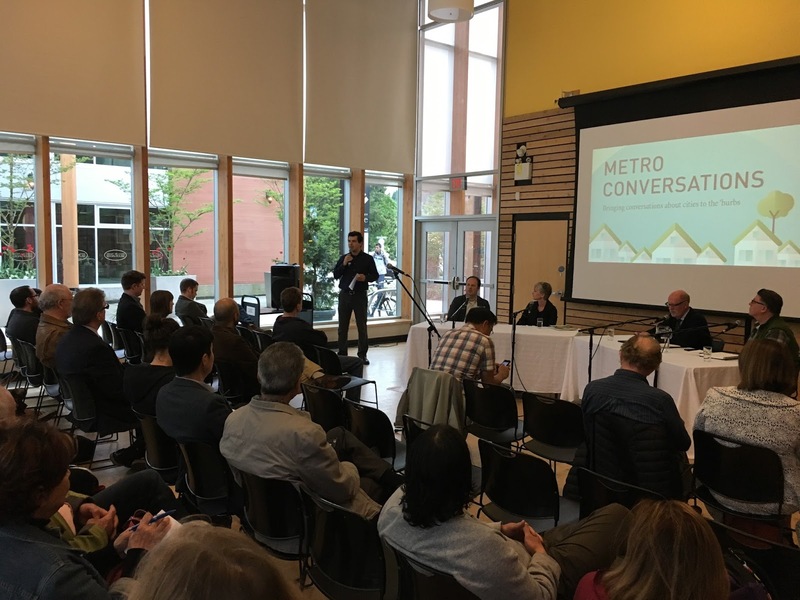 Last night's Metro Conversations was hosted at the Lynn Valley Village Community Room. Select image to enlarge. Since the fall of last year, I have been working with a team of other municipal councillors in the region on Metro Conversations. So far, we have hosted a conversation in New Westminster about short-term rentals, and a conversation in Langley City about affordable housing and renewing old apartment buildings. Earlier this year, we received financial and logistical support from SFU Public Square to continue this series of conversations for another year. With their support and the support of North Vancouver District Public Library, we hosted our third conversation in the District of North Vancouver last night. 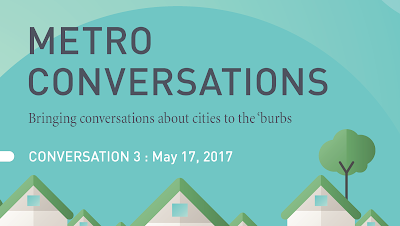 For more information about the format of Metro Conversations, and the panel members, please check out an earlier post. What are we trying to protect when in comes to single family zoned areas? According to the four panel members, most people are trying to preserve neighbourhood character. When people think of neighbourhood character, the panellist noted that most people think about density in an area. They discussed that density, or the lack of density, doesn’t define neighbourhood character. What defines neighbourhood character is the scale of a neighbourhood and the design of its public realm. For example, the height of buildings, and how they are set back from the street and each other defines character. Downtown Langley and Downtown New Westminster both have a different character because of scale and setback. Also, the design of the public realm defines neighbourhood character. A tree-lined street or a street with a green boulevard defines neighbourhoods. Finally, the panel members noted that people also create the character of a neighbourhood. After talking about neighbourhood character, the topic of housing affordability came up in the conversation. The panellist agreed that neighbourhood character can be preserved while increasing density to provide more affordable housing options. Great examples were given about laneway houses, three-level stack apartments, row houses, carriage houses, and other unique housing types that can be built to provide more housing options in neighbourhoods while preserving character. For a good read on in-fill housing, please view a recent report from the Greater Vancouver Home Builders Association. In most municipalities, panel members stated that building these types of in-fill housing options is difficult. They said that local governments need to update their policies and bylaws to allow more housing flexibility. Some people that attended the conversation asked about aging-in-place, and how to build walkable single-family/in-fill housing areas. One of the panel members noted that people need to be in walking distance of place(s) that sell these four fluids: milk, beer, coffee, and gas. Panel members talked about the importance of the corner store in creating more walkable areas. One of the panel members also brought up the need for providing small-scale daycare facilities in single-family/in-fill areas. In Langley City, we have this today. The topic of parking came up. Based on panel members’ experience, they noted that as areas become more walkable, the amount of parking required becomes less even as density increases. There were other topics discussed by panel members and other people that attended the conversation. We are working on putting together a podcast series, so people can listen to these conversations in whole. The new Timms Community Centre has been open for a little over a year now, and whenever I'm at Timms, it is always busy. But just how busy is the new community centre? In 2015, 43 drop-in fitness programs and 77 fitness programs that required registration were offered. With the addition of the new Timms Centre in 2016, 106 drop-in fitness programs and 146 fitness programs that required registration were offered. One of the stats that I’m really pleased to see is the increase in the number of youth that are using our recreation services. In 2015, 1138 young people participated in drop-in activities. This increased to 2454 in 2016, a more than doubling! Some of the activities include girl’s nights, guy’s nights, youth nights, and youth week. When you give young people opportunity to take part in positive activities, you reduce the likelihood of them taking part in negative activities. People that live in Langley have a lower average income than the rest of the region. The opportunities that Langley City recreation services provide give people an affordable option to take part in positive activities that make them and our community healthier and happier. The following graph shows how many times drop-in passes were used in 2016 and 2015 at Timms Community Centre. This statistic is different than number of participants. A participant can use a drop-in pass more than once. As shown in the table, drop-in pass usage has doubled. These numbers clearly show that there is a desire from Langley City residents to take part in the activities provided by our recreation services department. I am happy to see that the City’s investment in Timms Community Centre is already paying off. Over the last little while, Langley City council has set policies to renew our community to build both social and physical infrastructure. Whether it is the record-level $4 million being invested into our parks system this year, or increased funding for family-friendly activities in our community, Langley City is turning a new page. Of course, we still have challenges in our community such as reducing the number of people who are homeless, but we are tackling these challenges, and advocating to the federal and provincial governments for help. New Langley City logo. Select image to enlarge. With our renewed focus on community building, the timing was right to update Langley City’s brand. We are renewing our physical infrastructure, and items like park signs, banners, trail markers, and kiosks are being replaced. It is little to no cost to update branding as part of this renewal process. An example of Langley City's new business cards and pocket folders. Select image to enlarge. To be frank, our old branding was problematic; a warning sign was one of the strongest brand elements. Old Langley City branding element. 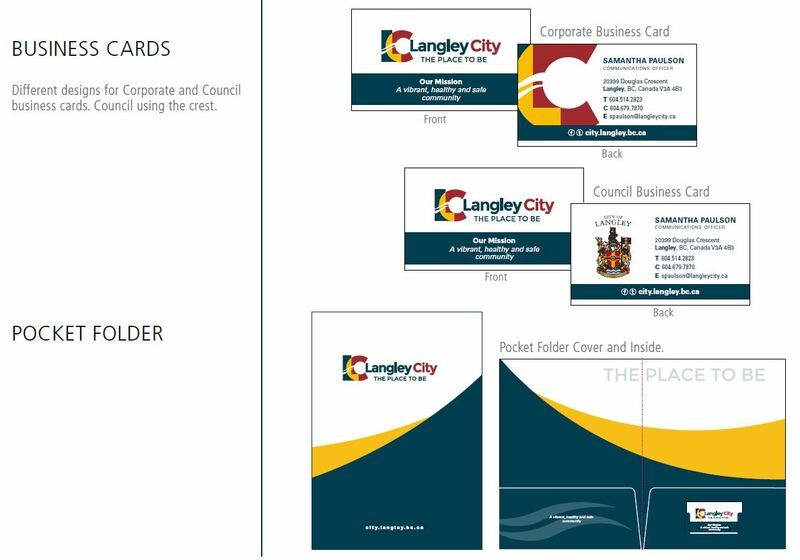 Langley City’s new brand includes all visual identities for our community, but the item that usually receives the most attention is the logo. What is the story of our new logo? Most community logos include the colours blue and green. In our region, these colours generally reference water, mountains, and greenery. While our new logo does reference the Nicomekl River and floodplain with a water element that runs across the “LC.” The new logo’s colour pallet references the City’s coat of arms. The name “Langley City” instead of the “City of Langley” acknowledges what locals already call our community today. One element of the old brand that was retained was “The Place to Be” slogan. This tagline was kept because it is well-known in the community, and still represents Langley City’s vision. Over the next little while, you’ll start to see the new brand being rolling out as the City continues with infrastructure renewal. Currently, the brand is being rolled-out on the City's website. Last week, I attended the Lower Mainland Local Government Association's annual conference. The LMLGA represents the voice of local governments in the Squamish-Lillooet, Metro Vancouver, and Fraser Valley Regional Districts. A friend of mine and Councillor in New Westminster, Patrick Johnstone, posted an overview about his experience at the conference on his blog. One of the interesting sessions that I attended was on railway proximity issues. The session included presentations by representatives from the Federation of Canadian Municipalities (FCM), Port of Vancouver, and CP Rail. Langley City like most municipalities in Canada grew around railway lines. Over the years, this has created noise, traffic, and safety issues. Railway companies have traditionally taken the approach that they were there first, and that any migration measures to reduce the impact of railways were the responsibility of government. I was told by panellists that this is no longer the case, and that railways are looking to partner with communities. As an example, the FCM and Railway Association of Canada released “Guidelines for New Development in Proximity to Railway Operations.” It is the hope that local governments throughout Canada adopt these guidelines. 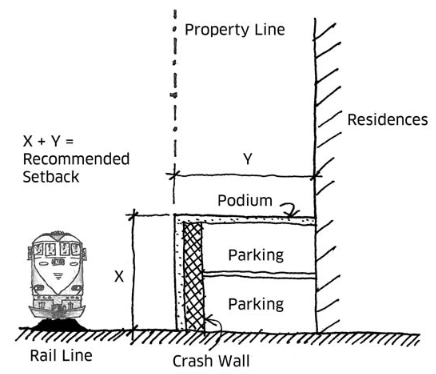 Where there is room, the following diagram illustrates an ideal design to protect built areas from rail lines. Standard mitigation for new residential development in proximity to a main line railway. Select diagram to enlarge. Since we don’t live in an ideal world, the guide also contains other mitigation techniques such as the following. Example of reduce-setback mitigation for new residential development in proximity to a rail line. Select diagram to enlarge. The regulation of railways is generally the responsibility of the federal government, and the feds do provide funding to move railways out of urban centres. In Langley City, the railway used to go right down Michaud Crescent and Glover Road. 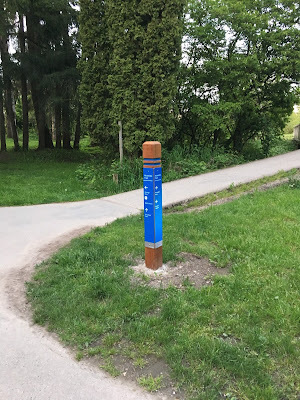 The railway in our community was already relocated. Our community has grown, and so has the volume of rail traffic. The number of trains going through Langley to Port of Vancouver facilities is predicted to increase to over 60 trains a day. Over the last 15 years, a series of overpasses have been built at 192 Street, 54 Avenue, 196 Street, 204 Street, and Mufford Crescent to mitigate the impact of increased rail traffic through our community. These projects were funded by all levels of government, the port, and railway companies. 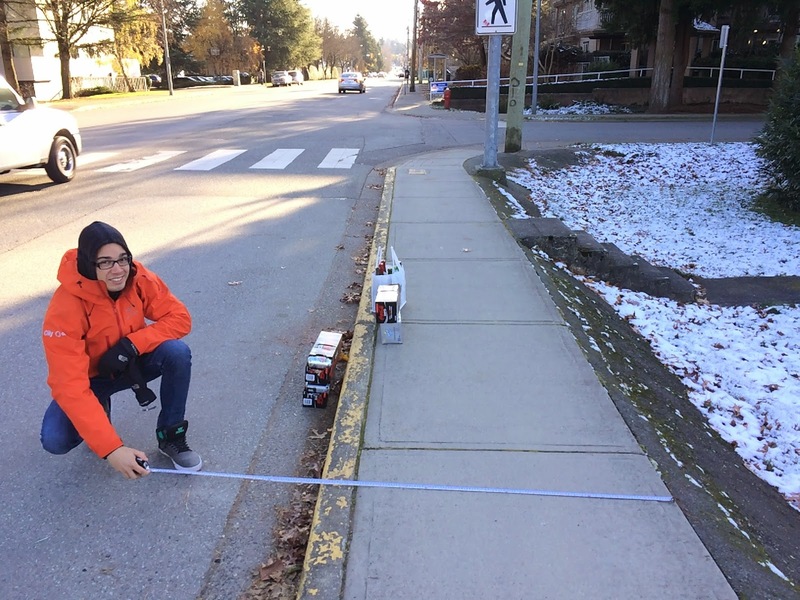 Even with this work, there are still three key roads where there are level crossings in the City: Fraser Highway, 200 Street, and the Langley Bypass. With 60 trains a day, these roads will be impassable. Because of the current volume of traffic, and because these crossing are in built areas, constructing overpasses or underpasses will be a costly and disruptive endeavour. I asked the panel members if they could think of other completed projects in Canada, similar to what is needed at 200 Street and Fraser Highway. While I didn’t get specific examples, I was told that it is possible. At some point in the next decade, serious planning will need to start to grade-separate the railway crossings at 200 Street and Fraser Highway. It will take funding and support from all levels of government, and the railway companies. A few weeks ago, I had a chance to sit down and chat with Jordon Miller who is the co-owner of the Vancouver-based Dandy Lion Cargo Bikes. He also recently started “The Dandy Lion Podcast” which is a long-form conversation format podcast featuring people who, according to Jordon, are doing “incredibly positive” things in Metro Vancouver. During the podcast, we chatted about why I got involved in local government. We talked about why partisanship in local government doesn’t work well, and why providing a high-quality of life for residents by delivering services is the core mandate for local government. We had a conversation about the increase in people who are experiencing homelessness in Metro Vancouver and Langley, and the role of local, provincial, and federal governments to reduce homelessness. We also chatted about regional cooperation, bridges, TransLink, and road pricing. We talked about the importance of engaging citizens in our community. I also talked about how Langley City council is working to create public space that builds a strong, health community. …He’s also incredibly well-versed in the developmental history of our region, and that knowledge certainly seems to influence his decision-making. If you find yourself pessimistic about politicians in general, Nathan certainly comes across as a breath of fresh air. Yesterday, I posted about items on Monday’s Langley City council agenda where members of the public could provide feedback. I also posted about a development permit that was issued. Today, I will cover the remaining items from that agenda. If you’ve walked, cycled, scootered, or drove around our community lately, you’d have noticed that there are many City projects on the go. Council received an update on City projects by Rick Bomhof who is the Director of Engineering, Parks and Environment. Traffic calming, and making walking and cycling safer is a major priority for our community. The 203rd Street project is nearing completion. It is now open, and the grand opening will be held on June 9th at 11:00am. Finishing touches on 203rd Street. Painting bike lane and crosswalk markings at an intersection. Select image to enlarge. The City is also traffic calming four other areas in the community. 50th Avenue at Conder Park, 198th Street at Brydon Park, Michaud Crescent at Linwood Park, and 201A Street at Linwood Park. All traffic calming must have the majority support of residents in the area. 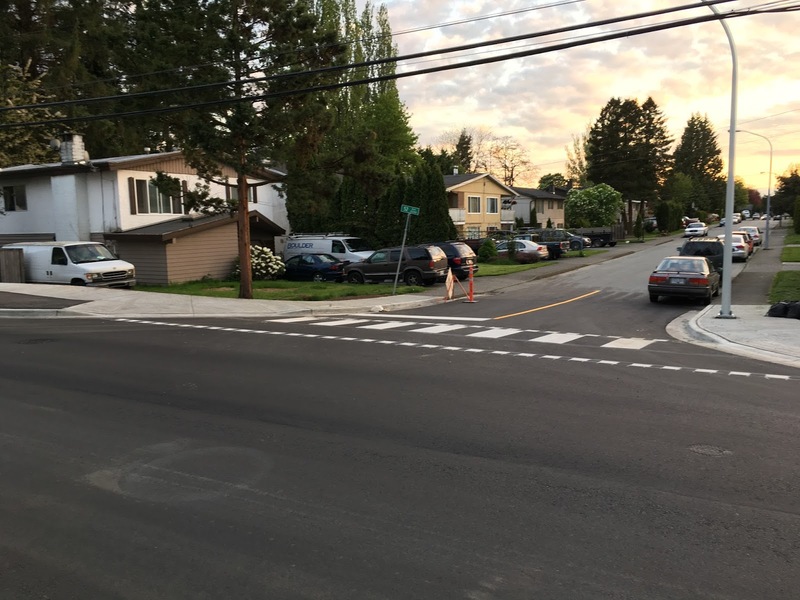 Not surprisingly, all traffic calming proposals have received community support. Open houses are being scheduled, with the first meeting scheduled for the end of this month. More information will be posted to the City’s website. A presentation to City council about Penzer Action Park. Select image to enlarge. Council increased the operating funding for maintaining our parks, trail network, and roads this year. Because of this, crews are extra busy. If you go along 208th Street, you’ll see one of the projects that was recently completed. New wayfinding is installed along Langley City's extensive trail network. Select image to enlarge. One of the things that I've noticed is that the City is doing a much better job of ensuring accessible access during road construction projects for people with limited-mobility. I commended City staff for ensuring that accessible access is maintained during projects at the meeting. One of the key things to creating a strong community, and driving out negative activity, is to use our public spaces for positive activity. This year, Council approved addition funding for more events and activities in our community. Council received a Recreation Update at Monday’s meeting. Some of the upcoming events include the Food Truck Festival on June 3rd and the Try-it Triathlon on June 11. The McBurney Plaza Summer Series will be starting next month as will other events in Downtown Langley. Events will be posted on the City’s website. At the meeting, Council also gave final reading to the tax rate bylaw which helps fund the 2017 Financial Plan which was approved earlier this year. At last night’s City of Langley council meeting, there were three items on the agenda where members of the public could provide feedback to council. 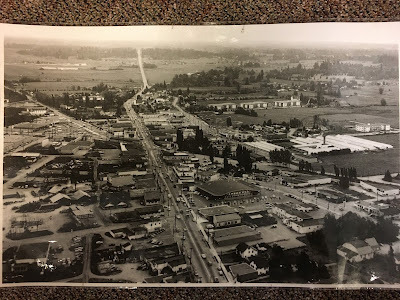 The first item was a rezoning application for the property which is currently the site of the Yale Manor on Brydon Crescent that was formerly owned by the Langley Lions Seniors Citizens Housing Society. 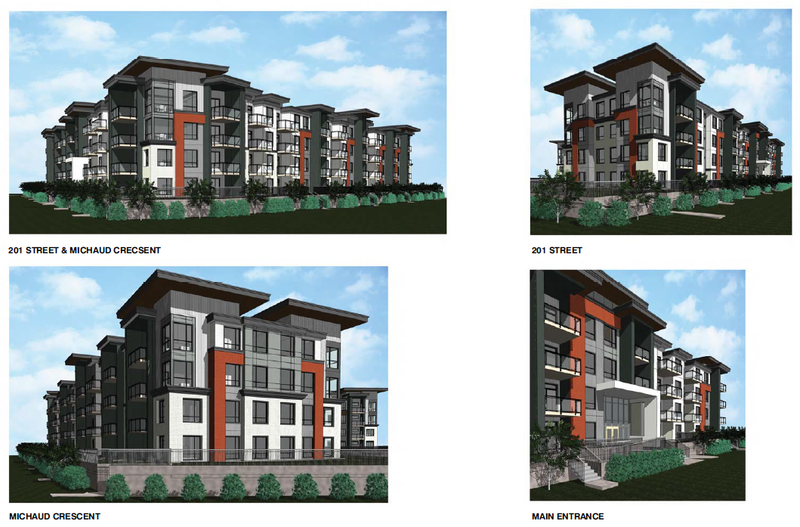 The rezoning application would permit a 4-storey, 54-unit apartment building on the site. Rendering of the proposed apartment building located on the site of the Yale Manor. Select image to enlarge. 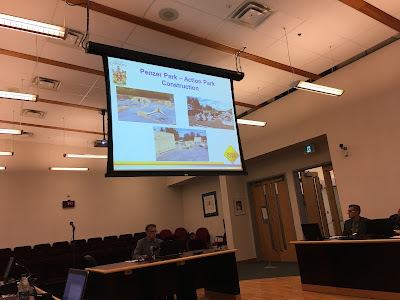 The official community plan would normally allow up to 90 units on this property, but because the property backs onto Baldi Creek, sections of the property are within the City’s restricted Environmentally Sensitive Area which forbids development. One of the good things about this project is that all parking will be underground, so there will be no surface parking. Also, there will be both visitor and resident bicycle parking. Most apartments in Langley are built atop a podium due to the high-water table in our community. Sometimes this can create rather tall concrete walls which don’t contribute to creating an engaging public realm. Due to the soil conditions on this property, the front of the building will only have a 1 metre tall podium. The proponent of the project also hosted a community meeting for people within 100 metres of the property. About a dozen people attended, and according the proponent, the majority of the people supported this project. At the council meeting, a resident who lives along 199A Street spoke about the proposed rezoning. He was concerned about construction workers who park their vehicles on-street, limiting on-street parking for residents. He was also concerned about heavy equipment being parked on the street. He noted that he didn’t receive an invite to the community meeting hosted by the proponent. Finally, he was concerned that the construction crew for this project would not respect the neighbourhood; creating noise before 7am in the morning, and leaving litter in the community. This was based on his past experience with some construction projects in the area. City’s council took these concerns seriously. The proponent of the project committed to making the comments and list of people who attended the community meeting public. Council also instructed staff to work with the proponent to ensure that construction crews will be respectful of the neighbourhood. Construction crew parking concerns is something that I’ve heard about from many people in the community. For some projects, proponents have provided parking management plans for their construction crews. City council asked staff to work with the proponent to develop a parking management plan for this project. Construction projects do have an impact in communities, but these impacts can be limited with planning and by respecting neighbourhood residents. The rezoning application is consistent with our official community plan, and was given third reading by council. The second item for public feedback was for zoning a small piece of property from a former section of lane near Park Avenue. There were no comments from the public, and council gave that zoning application third and final reading. Hashed area is former lane that is now zoned. Select image to enlarge. The final item for public feedback related to the City’s 2016 Financial Plan. As I posted about previously, an amendment is required to incorporate the actual year-end financial results into the plan. There were no comments from the public about the amendment. Council approved the amendment. 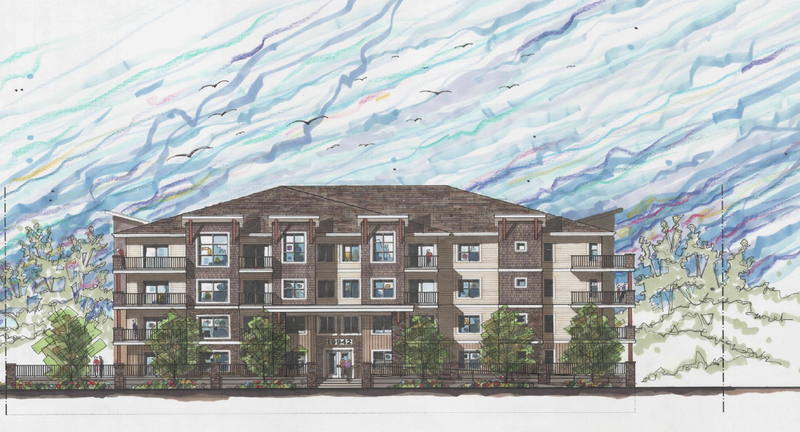 On the topic of development, council also approved a development permit for a 4-storey, 98 unit apartment building located at 201 Street and Michaud Crescent. I posted about this development proposal previously. Rendering of proposed apartment building located at the corner of 201 Street and Michaud Crescent. Select image to enlarge. Tomorrow, I will post about the other items on last night’s agenda. The idiom “if it ain't broke, don't fix it” gets used a lot. It is used when people see something change that appeared to be working well. To uses another well-worn idiom, appearances are deceiving. This is especially the case when it comes to municipal infrastructure. As municipal infrastructure gets older, the risk of infrastructure failure increases. For example, a watermain that is five years old is less likely to fail than a watermain that is 50 years old. Repairing a watermain that fails costs more money than replacing a watermain before it gets to the point of failure. Emergency repair works is not only costlier, but it can interrupt the delivery of service. For example, Metro Vancouver needed to replace some old valves on the only regional watermain that services Langley City residents. Because they replaced the valves before they failed, the City was able to activate a backup connection to the Township’s water system, and there was no interruption of water service in the City. Even with proper repair plans, at some point in the life of a piece of infrastructure, the cost of operating and repairing the infrastructure becomes higher than just replacing the infrastructure. If a city is on the ball, patching roads as soon as cracks or potholes appear, the life of a road can be extended. Over time, more and more sections of road need to be repaired, and the subsurface of the road needs to be replaced. When the amount of time and cost to repair hit a certain level, it becomes less costly to replace the road. A sports field might look perfectly fine, but the cost of maintaining it increases over time due to subsurface conditions. Many sports fields have drainage systems and lighting systems that over time deteriorate. Renewing a sports field will not only lower the cost of maintaining the field, but will make it more playable. Over time, new technologies become available that create significant infrastructure operational savings. For example, LED streetlights last longer and cost less to operate than conventional streetlights. Replacing conventional streetlights with LED streetlights reduce operational costs, and extend the useful life of streetlights. In Langley City, one of our main focuses is now on infrastructure renewal. You can see this in action with roads being renewed, streetlights being replaced, and sports fields being rejuvenated. One of the key things to know is when to repair infrastructure to get the maximum benefits out of it. 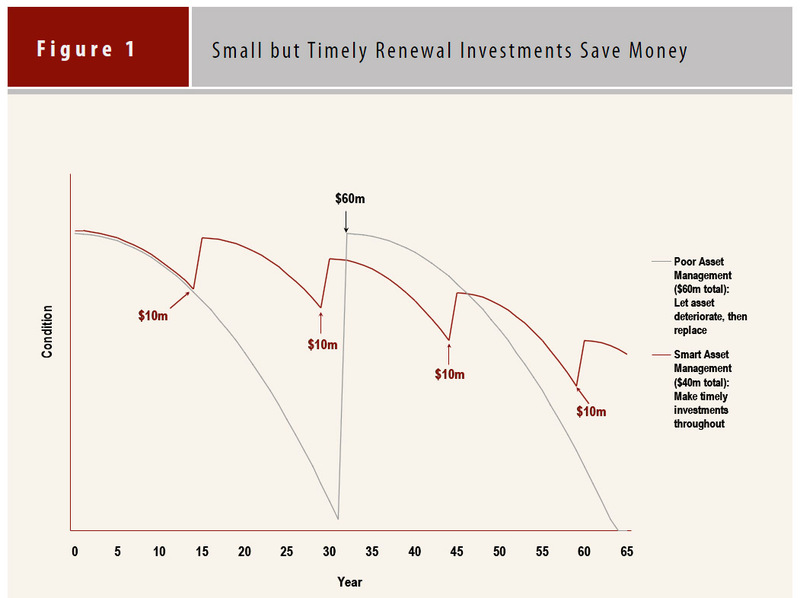 Replacing infrastructure too late is costly, and replacing infrastructure too early is also not wise. Langley City will be developing an assets management policy to ensure that long-term funding is in place to operating, maintain, renew, and replace our infrastructure in a way that creates maximum benefit for our community. So if you hear the expression, “if it ain't broke, don't fix it,” remember that it is always better to renew and replace municipal infrastructure before it deteriorates. It saves money and ensures continual service. Metro Conversations Presents: The Sacred Single Family Home. What are we trying to protect? Metro Conversations is on the road again, bringing important urban conversations out of the big city and into the ‘burbs. 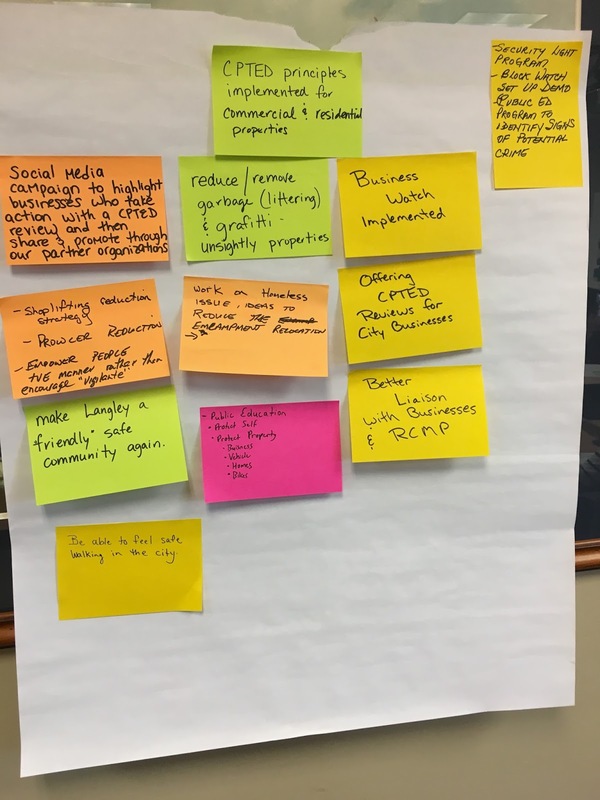 After two successful conversations in New Westminster and Langley City, the third discussion aimed at creating a larger conversation on urban issues is coming to North Vancouver. Started by four like-minded young City Councillors, Metro Conversations offers a unique format bringing experts in the field together with citizens for two-way dialogue and discourse within a strict 1-hour time limit. Beyond a lecture, it is a sharing of ideas. Our panelists for the conversation include Michael Geller who is an architect and developer, Krista Tulloch who is a member of the District of North Vancouver Official Community Plan Implementation Committee, Cameron Maltby who specializes in custom home design, and Neal LaMontagne who is a City Planner and Adjunct Professor at UBC and Langara College. This free conversation will take place on Wednesday, May 17th from 7:00-8:00pm in the Lynn Valley Village Community Room, 1277 Lynn Valley Road. Inequality in Home Owner Grant and School Property Tax. Langley City affordable housing leader. 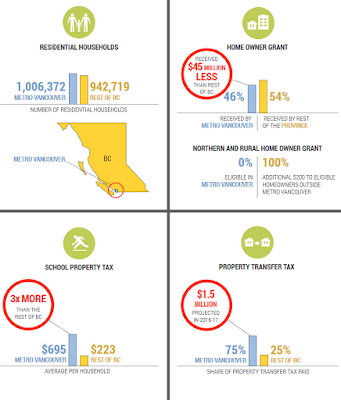 Metro Vancouver, our federation of local governments in the region, recently released a report on property tax in Metro Vancouver. Property tax system needs reform: Metro Vancouver homeowners shoulder tax burden. Select infographic to enlarge. A little more than 50% of property tax is controlled by local municipal governments in Metro Vancouver, the remainder of property tax is controlled by the provincial government and other agencies. Because of how the property tax system currently works, Metro Vancouver property owners end up paying more property tax than the rest of the provinces on a per capita basis. For example, provincially-controlled school tax in Metro Vancouver covers 61% of the expenditures of school districts in our region. In the rest of BC, school tax cover 31% of the expenditures of school districts outside of Metro Vancouver. The Metro Vancouver report authors also found that the lion’s share of property transfer tax comes from Metro Vancouver, and the Home Owner Grant cut-off level doesn’t reflect the value of property in our region. The Metro Vancouver report authors defines some of the problems with property taxation system inequality, and proposed some solutions. When it comes to the Home Owner Grant cut-off, the recommendation in the report is to have the province shift away from a single threshold throughout the province, to a system where the cut-off is unique in every regional district to ensure that 91% of residential properties on average in each regional district would qualify for the grant. A similar idea is proposed for school property tax. The recommendation in the report is to have the province adjust the school property tax rate in each community to ensure that the school property tax covers around half of the expenditures of each school districts. For the windfall revenue from the property transfer tax received in Metro Vancouver, the recommendation is that the province use this unbudgeted revenue to invest directly back into regions for local government infrastructure, transit, and affordable housing. 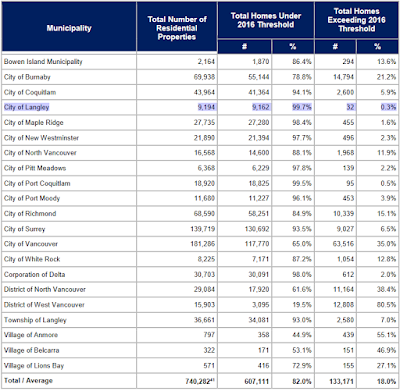 One table in the report that stood out to me was the total residential properties by each municipality that would quality for the 2016 Home Owner Grant in Metro Vancouver. In Langley City, 99.7% of all residential properties would qualify for the Home Owner Grant. This is the highest percentage in the region. Home Owner Grant eligibility by municipality in Metro Vancouver (2016). Select table to enlarge. 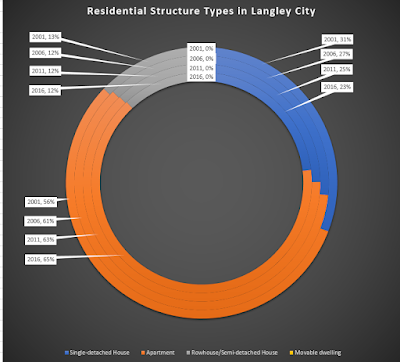 This is no surprise as Langley City has the highest percentage of land dedicated for apartments and rowhouses in the region. We have been redeveloping our older single-family neighbourhoods in the north side of our community to provide a variety of housing types. While adjusting the Home Owner Grant cut-off will help give some people a tax break, it really doesn’t make housing more affordable in the region. The key to providing affordable market housing is by making the most of the current urban land base. In Langley City, we have been slowly increasing our population and housing variety for several decades by redeveloping older single-family areas with care. When I look at some other communities in our region, the same can’t be said. How to make streets safer, and reduce the amount of people who are injured or killed due to the use of motor vehicles, is changing. Old ideas of reducing the injury and death rate due to motor vehicle usage focused on building safer cars, and roads with wide lanes, wide shoulders, and centre barriers. Other conventional ideas to improve traffic safety include graduated licensing, distracted driving laws, and anti-impaired driving laws. The problem with building seemingly safer roads is that the design actually encourages more risky behavior and higher speeds. Regulating behaviour is hard to do, and there has been mixed success. These conventions ideas are focused around driving. 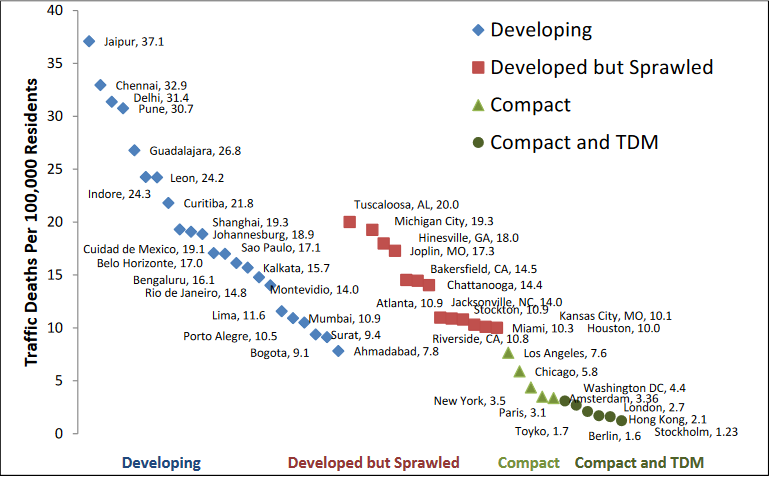 He found that how we design our communities plays a larger role in reducing per capita traffic crash rates than focusing on conventional traffic safety ideas. For example, building safer roads requires narrower lanes, not wider lanes as conventionally thought. Building walkable downtowns, and communities with a variety of housing options within easy walking or cycling distance, reduces traffic crash rates. Building a connected street network that encourages walking with wider sidewalks, and cycling with protected bike lanes, reduces traffic crash rates. Building high-quality public transit reduces traffic crash rates. Let’s say someone goes out to a pub with their friends and have a few. If they are in a community that is walkable and transit-friendly, they could walk or transit to and from the pub. If their community isn’t walkable or transit-friendly, they would likely drive to the pub. The risk of making a poor travel decision when they leave the pub is increased. The following table from Litman’s report shows that walkable communities that manage driving demand are safer communities with lower traffic fatality rates. 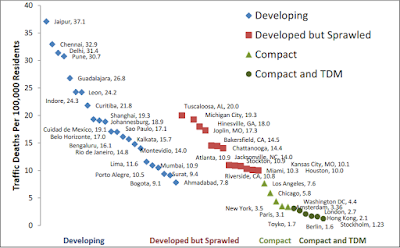 Traffic Death Rates For Selected Cities (Welle 2014 and USDOT Data). Select graph to enlarge. Communities with 50 transit trips a year or more per capita are safer with reduced traffic fatality rates. Transit Travel Versus Traffic Deaths in the U.S. Select graph to enlarge. 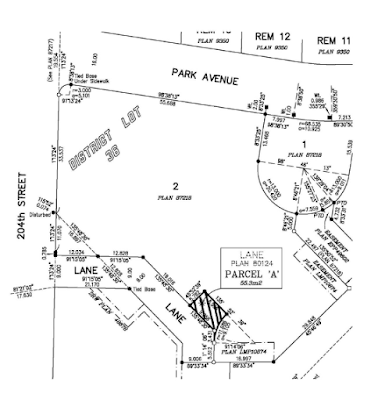 Langley City is a compact, walkable community though much of our road network was designed based on conventional ideas. I’m proud of the work that the City is now doing to design streets that encourage walking and cycling. Combined with our strong downtown and TransLink’s plan to improve transit service, Langley City is on the path to becoming a safer community with less traffic crashes per capita. I ran for Langley City council because I believe that local government has a direct, daily impact on people’s quality of life and the environment in which we all live. Running water, working sewers, great parks, safe streets, and a strong downtown are all the results of a well-run local government. Beyond being an advocate for members of the community, the role of city council is to create policies, and set the direction, that guide work done by city staff. Every member of Langley City council is independent which means that we all view what is in the best interest of our community through a different lens. One of the key documents that guides Langley City is its 5-Year Strategic Plan. 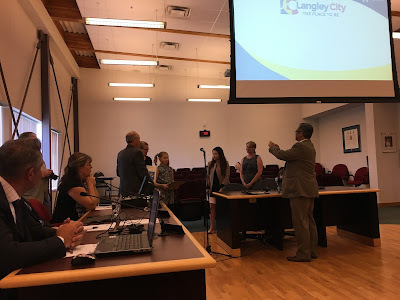 Langley City council and staff spent a good amount of time in workshops, distilling the viewpoints of every council member into one cohesive strategic plan. The strategic plan is the guiding document for all other City polices and plans. It also guides day-to-day City operations at a high-level. Langley City has recently released its draft 2017-2021 strategic plan to seek public feedback. 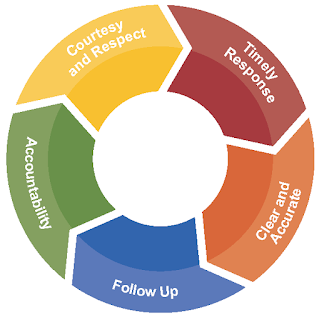 One of the overall guiding principles for Langley City council, and is evident in how City staff operate today, is a customer service focus. Langley City's Full Circle Customer Service Model. For example, if you use our City’s Request for Service portal to report a problem or express a concern, the City's goal is to get back to you within 24 hours of a request. Infrastructure Renewal: We recognize the need for, and are committed to, establishing, a long-term, financially-responsible infrastructure renewal plan for all municipal assets. Quality of Life: We are a community that is an ideal place to raise a family, offers a welcoming and affordable living environment, boasts great leisure and recreational opportunities, and supports healthy, safe and diverse neighbourhoods. Communication: We communicate effectively with our citizens, customers, partners, and stakeholders, involving them in decisions which impact and interest them, and engaging them in public life. Revitalization: We have a revitalized downtown core that is vibrant, clean and safe, is a desirable location for industry, and our policies and strategies create a vibrant economy that position the City as the Regional Hub in the Fraser Valley for innovation, education, technology, shopping, health industry, leisure, and entertainment. Environment: We continue to focus on protecting, promoting and enhancing environmental assets in the community. Organizational Excellence: We stand out as a results-oriented, engaged and innovative work force with a strong service ethic and high level of customer service, and a City Council that is accessible to its citizens. You can see the breakdown of these priorities in the following graphic. 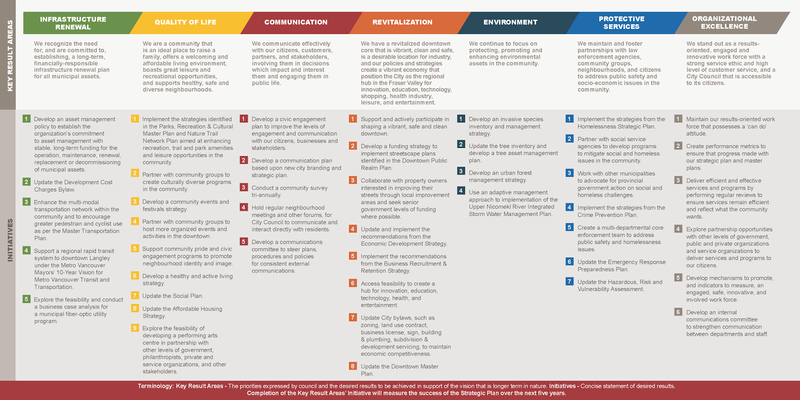 Langley City's proposed priorities and key initiatives in the draft 5-year strategic plan. Select table to enlarge. 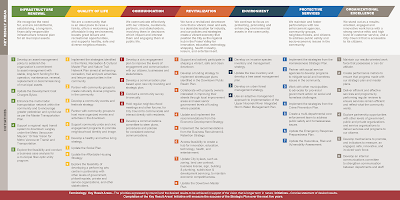 You can view the Strategic Plan at a Glance on the City’s website. If you have any feedback you’d like to provide about the plan, please email info@langleycity.ca with the subject heading “Draft 2017-2021 Strategic Plan” by Wednesday, May 10, 2017.